Motoritis or Other Interpretations of the Motor Act - Charles ‘Chas’ Crombie (illustrator) 1906 - Simpkin, London - First Edition	A superb rare and large (38 x 27.5 cm) folio. 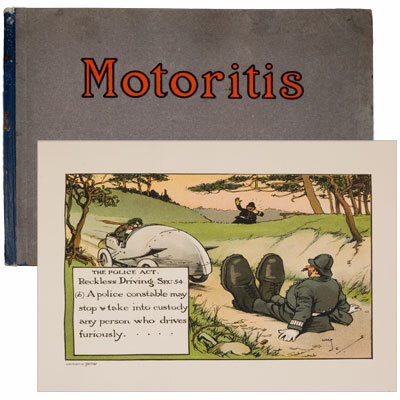 ‘Motoritis’ contains twelve colour plates of humorous ‘Other Interpretations’ of the newly passed 1904 Motor Car Act. Section 1 of the Act introduced the crime of reckless driving, which Crombie aptly illustrates in the third plate. Produced for ‘Perrier’ ‘The Champagne of Table Waters’, with additional colour plate advertisement for them, and bottle labels to the verso of each of Crombie’s illustrations. Charles ‘Chas’ Exeter Devereux Crombie (1880-1967), son of Scottish architect James Crombie. Crombie worked as an artist and sculptor, and by 1911 he was living with his wife in Hogarth House, Lambeth (part of which, in 1915, was sold to Leonard and Virginia Woolf, who named their publishing and printing business ‘Hogarth Press’). Crombie became a popular and successful illustrator and sporting cartoonist, most well known for this three books of cartoons produced for the French company of Perrier on Driving ‘Motoritis’, ‘The Rules of Golf’, and ‘Laws of Cricket’.